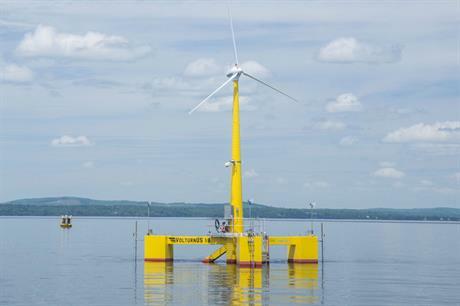 UNITED STATES: Regulators have approved the design for the University of Maine's (UMaine) floating offshore wind platform demonstration. The university’s VolturnUS project is based on a concrete four-column semi-submersible hull concept. The team from UMaine’s Advanced Structures and Composites Center believe it could soon be a "viable and economical alternative for offshore wind developments in water depths greater than 50 metres". A 1:8 scale model of the prototype was successfully tested off the coast of Castine, Maine, in 2013. Having been approved by the American Bureau of Shipping (ABS) it is to be piloted in a full-scale, two-turbine demonstration at the 12MW New England Aqua Ventus I site. UMaine said it was the first time a floating offshore wind platform has been approved by ABS. Anthony Viselli, UMaine's engineering manager, said ABS worked closely with the university through all design phases of the Aqua Ventus project. "We are excited about the positive results from the design review and the potential for deploying this technology elsewhere in the US and abroad," he said. The project had missed out on a US Department of Energy (DoE) grant for $47 million in May 2014. UMaine was instead awarded $3.8 million in DoE funding to complete the full-scale design of the platform. But in May 2016 two projects that were successful in their applications in 2014 missed the deadline for submitting final engineering design, permitting, installations and operations and maintenance (O&M) plans. As a runner-up in the DoE’s offshore demonstration programme, VolturnUS was awarded full funding. After VolturnUS passed ABS’ review, Habib Dagher, executive director and principal investigator at UMaine’s Composites Center, said: "After ten years of development, this is a major milestone for our program, and we expect the VolturnUS hull concept to continue to attract private investment from the US and around the world. "Nearly 70% of the US’ offshore wind resources can be captured using the UMaine VolturnUS technology, and we are looking forward to working with offshore wind developers across the US."